Asқarova Nazym Srazhadinқyzy, born in 1990, by nationality – Kazakh, a citizen of the Republic of Kazakhstan, has a higher education, graduated with honors from Karaganda State Technical University in 2011 with a degree in geology and exploration for mineral deposits. Asқarova N.S. 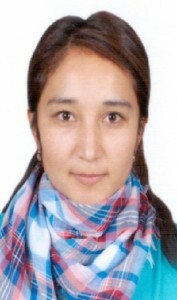 In September 2011, she entered the magistracy in the specialty “Geology and Exploration of Mineral Resources” and worked part-time at the Department of Geophysics and Geology as an assistant until June 30, 2013, and taught the first course in the discipline “General and Historical Geology”. She published 1 scientific article, co-authored 4 educational and methodical works, 1 certified electronic development. Conducts laboratory and practical classes in the following disciplines: “Zhangy zhenne tarihi geology”, “Geomorphology and Quaternary Geology”, “Industrial Types of Mineral Resources”.